People in the East were salivating over the fact that the Mann Cup was coming back “home”. Whispers around the rinks were that the West just wasn’t strong this season. All the talent came back to the MSL this season, so the WLA champion would really just be an also-ran in the Mann Cup. The Maple Ridge Burrards are certainly proving that false. After two games against the Six Nations Chiefs the tournament is tied at one game each. Game three goes Monday night at the Iroquois Lacrosse Arena in Ohsweken. Six Nations stormed out of the gate with a 15-8 win on Friday night. Two separate five goal runs shocked the Burrards who trailed 5-1 after the first and 9-5 after the second. The Burrards tried to fight back in the third period physically and gave the Chiefs six power play opportunities. Overall the Chiefs were five for nine on the power play. Dan Dawson led the Chiefs with three goals and five assists. Dhane Smith had a goal and six assists, Ryan Benesch three goals and two assists, and Randy Staats two goals and three assists. Austin Staats had two goals and an assist. Single goals went to Ethan O’Connor, Roger Vyse, and Brier Jonathan. Riley Loewen led the Burrards with two goals and three assists. Ben McIntosh had two goals and two assists. Other goals were scored by Dan Taylor, Connor Goodwin, Jarrett Davis, and Aaron Davis. The opening game is always hard for the visiting team as they get used to a new arena, a new city, and even a new climate. The fans are new and every arena has its own quirks. The Burrards regrouped and came out firing in game two, winning 13-9. The Chiefs scored first but the Burrards rattled off four in a row for the first period lead. The second period was more even as the teams traded goals. With the Burrards leading 8-3, Austin Staats cut the lead in half but the Burrards spotted Jarrett Davis coming off the bench on the next play and he scored on a fast break to cut any momentum the Chiefs thought they had gained. In the third, the Chiefs managed one of their patented runs, scoring four in a row late in the game to bring them to 12-9. Late penalties, however, stemmed the comeback, with Staats sent off for five and Sid Smith off for two shortly after. Loewen scored an insurance marker on the power play for the Burrards. Dawson’s eight points in game one and another eight points in game two bumped him far up the all time Mann Cup scoring race. In two games he jumped from 9th – past Josh Sanderson, Bill Wilson, Gary Gait, and Scott Evans – to occupy fifth place alone with 124 points. Colin Doyle sits fourth with 137 points and it’s not out of the question for Dawson to reach that mark too in this tournament. If you’ve talked to Dawson, you know individual accomplishments are the furthest thing from his mind when he’s in game mode. “It’s the people you surround yourself with,” he told JVI’s Sam McDaid during a second intermission interview, of his point totals. “For us, it’s about winning. I’m not worried about points. We’re worried about getting ahead of these guys, getting back in this game and making plays. Chiefs backup goaltender Doug Jamieson saw time in both games; just a few seconds at the end of the first game in case things got out of hand, but Dillon Ward was pulled early in the third period on Saturday after he let in the 10th Maple Ridge goal. Scigliano made 51 saves in game two and was named the Burrards’ player of the game. 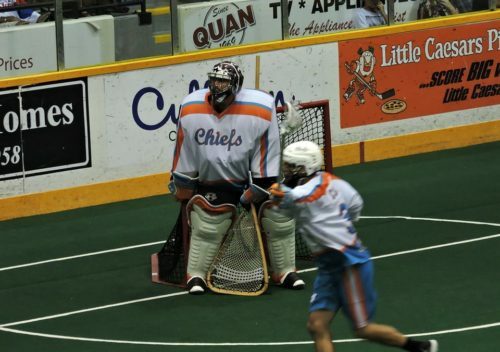 Cody Jamieson has not played so far in the Mann Cup after leading the Chiefs to four straight wins over the Peterborough Lakers in the MSL final. Jamieson is awaiting knee surgery.